Our products carry the most absorbent polymers in just the right places. They quickly draw the liquid away from the body to prevent wetness, leakage and rashes. Throughout this process, it is important to provide adult incontinence products that ensure the comfort and protection of the individual as well as their living conditions. For urinary incontinence, there are many options that not only protect, but maintain a level of modesty. 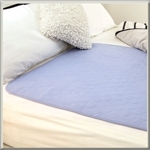 Our pads available for sheets and bedding are washable, helping provide easier clean-up for the caregiver. Increase comfort and ease transfers between bed and chair.